Stephen Glassman first came to international attention while creating large-scale bamboo installations in urban sites devastated in the wake of the Rodney King Riots, Malibu Fires and Northridge Quake. These works became local symbols of resiliency as well as a springboard for the permanent, monumental public works he creates today. Deaf and unable to speak as a child, Glassman seized art as a means of communication and self-expression. He went on to receive his BFA from SUNY Purchase and spent years traveling the country as a circus and street artist. In 1979 he settled in Venice, CA where the neighborhood alleys were dotted with the studios of Dennis Hopper, Ed Rusha, and Black Flag. Glassman was drawn to Venice’s sun baked landscape of dilapidated piers, cracked bleached concrete, fallen fences, and vast horizons – a remote outpost on the edge of Los Angeles and a hidden hub of creativity that would become known as Dogtown – the epicenter of modern skateboard culture. 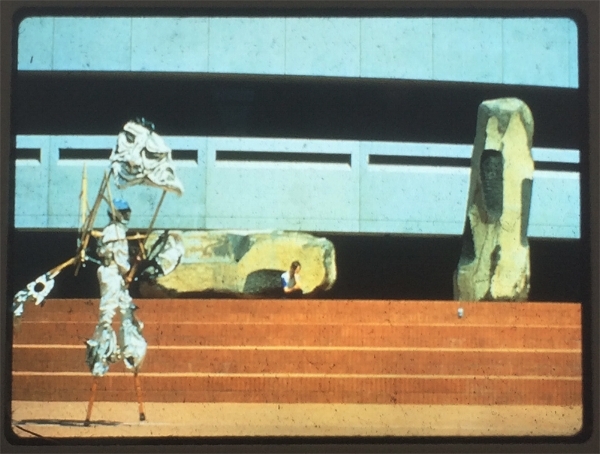 It was here that Glassman’s signature work took root – pulled directly from the urban landscape. Often formidable in scale, Glassman’s work is noted for how it “dazzles in slo-motion (and) creates a bracing, humanist kind of spectacle … that actually draws the viewer into the frame instead of alienating” (David Cotner, LA Weekly). Significant projects by Glassman include an eight story sculpture for architect Bjarke Ingels’ (BIG) torqued pyramidal skyscraper (currently under construction on Manhattan’s West 57th street); a 4,000 square foot sculpture plaza for the LNR Warner Center in Los Angeles; Arkansas’ Southeast Shear (an NEA/ White House Millennium commission), the Sylvia Campuan Bridge in Indonesia; “Thornton Creek” in Seattle; Calgary’s “Frozen River”; Port of Los Angeles master plan and more. These projects have involved the collaboration of designers and builders including BIG, Arup, The Durst Organization, Eric Owen Moss, Steinberg Architects, Sasaki, Miller Hull, and more. Much of Stephen’s practice has evolved from a creative and collaborative foundation in the theatre. He has worked with artists, directors, and venues including Moscow Circus, Phillipe Petit, Perry Farrell, Jonathan Borofsky, Nels Cline, Robert Wilson, Paris Opera, Los Angeles Music Center, Getty Museum, Olympic Arts Festival, Los Angeles Festival, Bread and Puppet Theatre, and more. Glassman’s public work has been included in the syllabi of classes at colleges and universities including Vassar, Syracuse, and Bard, and featured in the Lincoln Center Institute’s program on “Aesthetic Education.” Glassman’s design for “Urban Air” — a sculpture that transforms billboards into intelligently networked, floating bamboo gardens – has been the subject of over 21,000 blogs and articles, downloaded over 150,000 times on every continent, and has received over 600,000 hits on Google. Glassman is the recipient of numerous grants and awards including the National Endowment for the Arts, Nathan Cummings Foundation, London International Creativity Award, LA Cultural Endowment, and a 2000 Chrysler Design Award nomination. His private studio work has been collected and exhibited nationally and internationally. Published reviews have appeared in Art in America, the New York Times, Los Angeles Times, Village Voice, Artweek, Landscape Architecture, Huffington Post, International Herald Tribune, Wired, NPR, National Geographic, and more. Stephen Glassman still lives and works in Los Angeles with his wife – critically acclaimed director/choreographer Sarah Elgart – and their two daughters. Currently SGS is creating the eight-story sculpture for Bjarke Ingels Group’s (BIG’s) inaugural North American skyscraper - now under construction on West 57th Street overlooking the Hudson River in Manhattan. Commissioned by The Durst Organization - the world’s leading builder of green skyscrapers - the sculpture is located on a brand-new intimate private street in a mixed-use development spanning an entire block and several buildings, including the BIG torqued pyramid. A 4,000 sq ft sculpture plaza Inspired by the White Tailed Kite - a native bird that still inhabits the area and the ecological riparian history, “White Tail Plaza” generates landmark identity, shade, seating and a value added amenity for the Los Angeles Warner Center Campus. Part of the master plan team with steinberg architects. created landmark identity for the college, a conceptual context for the six block urban corridor it dominates. final plan created a singular skyline scaled building, plaza and green space that serves as a sculptural metaphor for this influential coastal city. awards - AIA Los Angeles Chapter, Next La Design Awards 2010, The Chicago Athenaeum, The European Centre for Architecture Art Design, American Architecture Awards 2010. Part of the master plan team with sasaki associates. scope of work included developing conceptual content and art opportunities for 95 acre sustainable buffer zone along industrial waterfront. Winner of AIASF Award for Excellence in Urban Design, and Northern California Chapter of American Society of Architects Honor Award. Commissioned by the White House Millenium Council (Hillary Clinton, Honorary Chair) and the National Endowment for the Arts. Reclaimed a derelict historic urban delta waterfront to create permanent freeform structural central plaza, including the renovation of an 1877 cast iron industrial facade, water features, landscaping and infrastructure. Overall dimensions - 80’ high, 90’ wide, 150’ long. structural engineer - T.J. Rowell; general contractor - Benny Hatcher/Select Constructors, inc. Commissioned to create a lighter than air flying boulder as museum and performance piece.